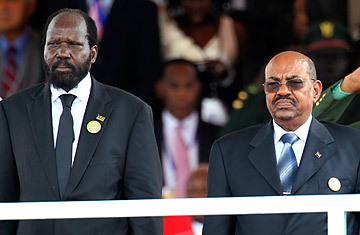 One month in, Sudan's version 2.0 is not showing much improvement over the original. So far, the July division of Africa's largest country into a newly free South Sudan and a shrunken Sudan shows few signs of ending the parent's bloody habits. The decades-long Arab-North-vs.-African-South feud continues, now through economic and proxy warfare. Both nations project to have weak central rule, internal strife and unruly militia activity for years to come. And any Western dreams of the "democratic transformation" promised in the 2005 peace deal that led Sudan this far have faded behind the flexing of autocratic muscles on both sides. The fundamental incongruities that led the old Sudan to fall apart seem to have been passed down directly to its offspring. International finance officials fear that an economic collapse of both countries could be just months away if the two sides refuse to strike key economic deals with each other. A fierce ongoing currency war could stick South Sudan with $700 million in worthless bills as both nations scurry to introduce new currency and undercut the other. To quarantine old Sudanese banknotes in South Sudan, Sudan's central bank has stopped all trade and money transfers to South Sudan, devastating tattered border economies and raising fears of looming humanitarian disasters. Meanwhile, Sudan is trying to mitigate its loss of southern oil fields by charging lucrative fees for South Sudan to use its pipeline and refineries, which South Sudan rejects even though it has no other option. Each side has threatened to cut off the oil exports if the other side doesn't budge  which would deal a fatal blow to both. Everyone knew South Sudan would face steep challenges in its early nationhood. But it is the sharp backsliding in the diminished Sudan that is sending alarm bells across a wider region that was already juggling the Arab uprisings on one side and a devastating Horn of Africa famine on the other. Far from consolidating President Omar al-Bashir's power within a smaller and more governable territory, the nation's partition has left the Sudanese leader severely weakened and scrambling to shore up his two-decade rule amid rising instability. International sources engaged with al-Bashir and the Sudanese government say the situation in Khartoum, the capital, is more volatile than most realize. According to a senior official with direct knowledge of the situation, the Sudanese military pulled what could have amounted to a soft internal coup in Khartoum in the weeks leading up to South Sudan's independence, during which time the North invaded the disputed border district of Abyei and then sparked a messy renewed conflict in the nearby Nuba mountains that has brought charges of ethnic cleansing. Senior military supervisors now sit in on al-Bashir's external meetings, say Western and African sources, even briefing outsiders beforehand on what the President will say. This picture seems to be corroborated by Julie Flint, a longtime journalist in Sudan, who reported this past week that a well-informed source close to the ruling National Congress Party (NCP) told her that in early May, the Sudanese military successfully demanded from al-Bashir unchecked power to do as it pleased. Much remains hazy. It is not clear if the military's move reflects a permanent power bid or just a temporary flash of military impetuousness. Nor is it clear how it alters al-Bashir's hand. A military man himself, who rose to power in an Islamist-backed coup in 1989, al-Bashir has always carefully maintained his military constituency within his wider party coalition of Islamist politicians and businessmen. The cracks in that coalition are as visible as ever, with al-Bashir even nixing a framework agreement for peace negotiated with rebel forces by his rigid NCP deputy, Nafie Ali Nafie, in late June, after the deal came under heavy criticism from military and other hard-liners. The military's seeming motivation  indignant anger at the NCP's mismanagement of the country, which led to Sudan's partition, loss of national pride and continued backsliding  is understandable, but its actions are not helping the situation. The ongoing war in Sudan's South Kordofan state has only weakened Khartoum's hand. There, the northern remnants of the Sudan People's Liberation Movement (SPLM), the South-based rebel group that now leads South Sudan, have taken control of most of the Nuba mountains since fighting erupted in early June. Khartoum's bloody ethnic targeting of civilians in the area has further isolated Sudan and put a damper on thawing ties with Washington. By blocking political accommodation of the regime's opponents, the military and regime hard-liners could be unwitting accomplices in their own demise. The geographically and ideologically diverse Sudanese rebel and opposition groups are pushing hard for a durable grand alliance, an elusive holy grail of Sudanese politics. Already the Justice and Equality Movement, the biggest Darfur rebel group, has fought alongside the SPLM in the Nuba mountains in South Kordofan. "If you find two groups fighting one enemy, it would be unwise not to cooperate," Malik Agar, head of the SPLM-North and governor of the Blue Nile state, tells TIME in Juba, South Sudan's capital, where much of the conspiring is taking place. So can Sudan's marginalized peripheries unite against Khartoum? "There is little in Sudan's history to suggest that they can," says Jon Temin, Sudan director at the U.S. Institute of Peace. "But these are unprecedented times in Sudan." Al-Bashir's opponents smell blood. "This is now a race between Khartoum trying to fix its internal house and the rebels keeping up the pressure so Khartoum does not come together," says Fouad Hikmat, a Sudan analyst for the International Crisis Group. The big wild card is Blue Nile, the next key flash point, and its forceful governor Agar, whose position on the sidelines looks increasingly untenable. When asked if dividing Sudan was a mistake, the burly general shrugs off the question with a dose of gloomy fatalism: "It was predicted that Sudan was going to split," he says. "And it is still predicted Sudan is going to disintegrate more." Presumably, if that happens, it will be with him leading the charge. See "Jubilation in Juba: What Does Freedom Mean for South Sudan?" Take a hidden tour of Juba, South Sudan's capital.